"Exposing oneself to media scrutiny requires more than simple candor and honesty. It requires knowledge, training, and a keen understanding of how reporters write the news." AWARD-WINNING JOURNALIST and crisis communications expert Jeff Ansell provides a complete, values-based framework for successfully navigating all types of media encounters. This framework offers executives, leaders, and communications professionals the practical tools and step-by-step messaging formulae needed to address problematic issues while limiting their exposure to the sensationalism of today's media environment. With nearly 40 years of experience, Ansell reveals the inside secrets to understanding the media, building credibility, and developing persuasive communication skills. To facilitate implementation, this how-to guide includes a complete Media Messaging Toolkit, a six-step interview and message delivery exercise, and numerous real-world illustrative examples. 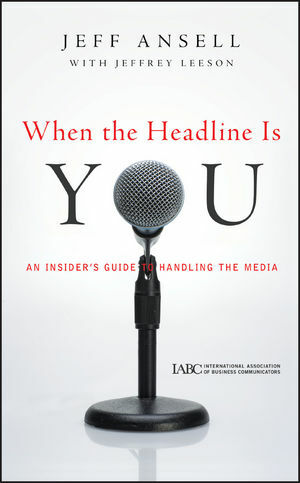 Whether delivering good news, not-so-good news, or dealing with a full-blown media crisis, When the Headline Is You provides all the insights and strategies necessary to manage image and enhance reputation.